Fourth of July features an old-fashioned parade of locals riding horses and pulling home-made floats. A local landmark is the Trabuco Oaks Steak House, which was a favorite restaurant of former President Richard Nixon. The Vedanta Society of Southern California has the Ramakrishna Mission Monastery on 40 acres (160,000 m2) in the canyon, founded in 1942 by renowned author and philosopher Gerald Heard. 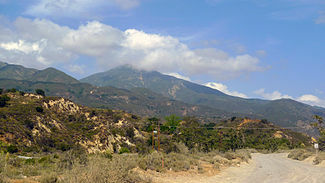 The Trabuco Canyon Community Church is located in the canyon also. ^ "OCFA". Archived from the original on 2007-10-27.